There must be several number articles on the internet related to ‘exam preparation tips’. But when it comes to JEE Main, it's a whole different story. JEE Main 2017 is not your average entrance examination, it is one of the toughest entrance exams in the entire world with over 7 million candidates appearing for the exam every year. So to think that you can approach the exam in a casual manner would be a big mistake. 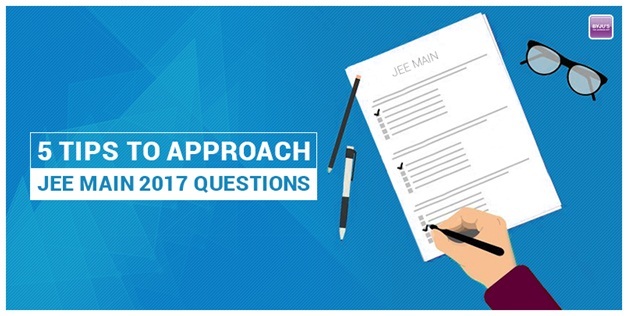 You will be needing a strategy to solve the JEE Main question paper in a smart way. If you do not have the right approach, then all your preparation will go to waste. There are so many students out there who study and prepare day and night but still end up doing bad in their exam. So in order to avoid such consequences, we have come up with five useful tips that can help you make a better approach towards JEE Main question paper. The first thing you must do when you get your question paper is to go through the entire questions in the paper as quickly as you can. The best way to start your exam is to filter the tough questions from the easy one’s. Answer all the easy questions at the beginning so that you have enough time at the end to think through the tough one’s. This is will not only save time but also help stay confident. Once your done with filtering your question paper down and answering the easier questions, you must then make an order to answer the remaining question paper. Arrange your answering by solving the your strongest subject first followed by the subject you're weak in and then end with the subject in which you are mediocre. This method will help you in a lot of ways, mainly giving you confidence as will float past the easy questions. Then you can approach the tough questions with confidence gained and finally end the third subject. It's always better to start with what you're good at and the same applies to your exam. In terms of subjects, chemistry is generally easier of the three subjects and has the least amount of calculations or computations than the other subjects. It is also the subject where you have high scoring potential. After you finish with chemistry, approach one of Math or physics, whichever you find to be easier. Sometimes we tend to brush aside the importance of rough work in our exams and problem solving. Although it might seem unimportant, rough work can be instrumental for you in getting a good score. First thing is that it helps you keep track and also helps in re-checking. Make sure you write the necessary steps. The most important aspect of every exam is time. In an exam like JEE Main, attempt rates are very crucial. After solving your problems make sure re-check them within 10 minutes. Assign a time cycle for each subject and make sure you finish solving the questions within the stipulated time. Keep aside 20 minutes for revision of the entire paper and 10 minutes for updates.